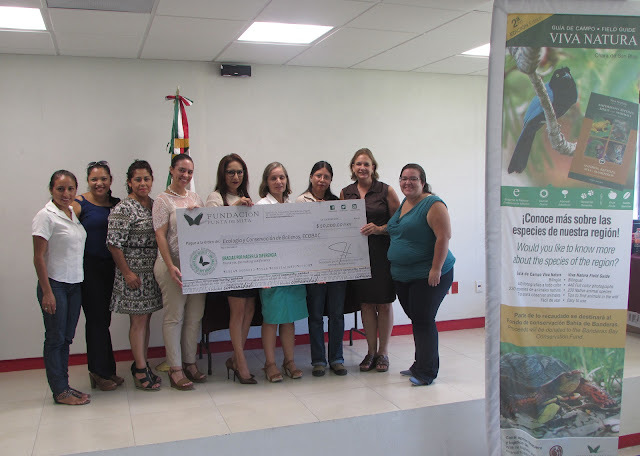 Civil associations CALEV, which is dedicated to rescuing wildlife and ECOBAC, which works on the prevention, surveillance and humpback whale monitoring, received the $60 thousand pesos in the fund. On Monday August 29, 2016 the Punta de Mita Foundation symbolically delivered the moneys from the Conservation Fund to the grassroots organizations that were accredited as the winners for their conservation projects on Banderas Bay. The winning organizations were the Centro de Rescate de Fauna Silvestre, CALEV A.C. and Ecología y Conservación de Ballenas, ECOBAC, A.C. The event took place at the Banderas Bay Technological Institute. A total of nine organizations presented conservation projects in order to participate in the call, but only two of them will be able to access the $60 thousand pesos that were in the fund; the other participants received consultations on the structure of their projects and will be able to participate again in the future. CALEV A.C. is dedicated to rescuing wildlife including birds, land tortoises, marine turtles, crocodiles and other species in order to nurse them back to health and reintroduce them to their habitats. ECOBAC works on the prevention, surveillance and monitoring of the humpback whales in order to keep local watercraft and visitors informed about the rules and regulations that are in place to prevent any harm or harassment of these cetaceans, which visit the bay constantly. Both associations seek to give back to nature and build a better society together with the environment. In the interest of transparency, the partnerships will request receipts for the work, and the Punta de Mita Foundation will then pay the suppliers directly. The Conservation Fund thrives on donations and sales of the Viva Natura Field Guide.